My three year old son Declan is absolutely obsessed with superheroes. Right now his favorite superhero is Spider-Man. So we spend a lot of time watching Spider-Man stuff on Youtube. As fellow parents have probably already discovered, Marvel and DC tend to be pretty tenacious about ensuring that parents and children not enjoy much in the way of Spider-Man, or Batman, or Superman, or Captain America for free on Youtube when they can be paying handsomely for the same privilege. This leads to weird bootleg videos that exploit the lack of official DC or Marvel content on Youtube with bizarre, almost nonsensical videos where a video-game quality representations of Captain America (or Superman or Batman) hop and run and jump against a cloying soundtrack of public domain nursery rhymes and children’s songs. Here’s one such video. It’s been watched just under three million times. These “videos” barely qualify as entertainment but that hasn’t kept Dex from staring at them, glassy-eyed, for seemingly hours. Literally anything is preferable to this tot-hypnotizing garbage so I was very pleased to discover that Youtube contains at least some official Spider-Man content in the form of an adorably clumsy cartoon that ran from 1967 to 1970. 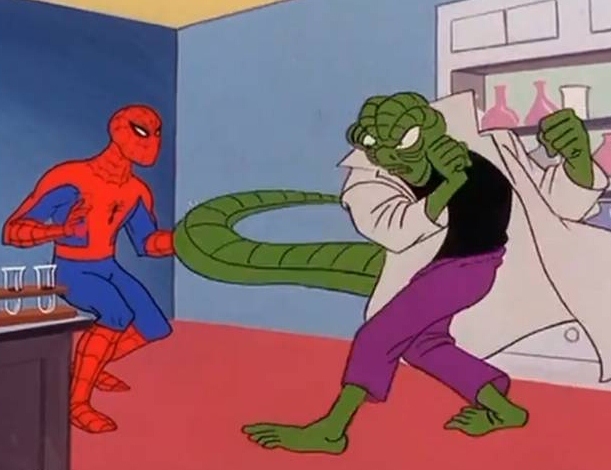 The animation for the 1960s Spider-Man cartoon can generously be deemed primitive and less generously deemed total garbage. The character design is stiff and awkward, the animation limited at best. It is unmistakably a cartoon aimed at small children that makes no attempt to be hip or cool or sophisticated or adult. There is no moral ambiguity in the 1960s Spider-Man cartoon. The bad guys are never anything but bad and one-dimensional, while our friendly neighborhood Spider-Man is devoid of the neuroses and angst that would define him both on the page and onscreen in his various iterations. The superhero world is now one of infinite grays and infinite darkness yet the world of the 1960s Spider-Man is aggressively black and white. Good is good, bad is bad, and there’s no confusing one for the other. There’s something weirdly seductive about the show’s kid-friendly simplicity. My disproportionate fondness for the 1960s Spider-Man is partially rooted in nostalgia, both for the sunny, uncomplicated role superheroes like Spider-Man once played in my life as a boy and for the groovy cultural moment that birthed this naively charming version of everyone’s favorite web-slinger. The 60s Spider-Man is oddly fascinating in its blunt clumsiness but there are also elements that are genuinely good. The theme song is rightly revered and remembered, and some of the backgrounds are so abstract, lurid and trippy that they border on surrealism. No less a cool cat than Ralph Bakshi was brought in to oversee the series’ second and third season, which were even cheaper and clumsier than the first two. We live in a world where seemingly everything has to have attitude. Everything has to have edge and a point of view. Anything that appeals to kids is expected to also appeal to adults on some level or be found lacking. So there’s something reassuring about the primitiveness of the 1960s Spider-Man and its complete disinterest in any audience older than six or seven. I’m addicted to the 1960s Spider-Man because it’s free, and Dex loves it, and I love anything that makes him happy, but its cracked innocence appeals to me. The 1960s Spider-Man makes no attempt to appeal to adults and parents like myself, and that, ultimately, is what I find most appealing about it.